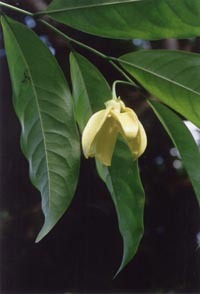 When young, this climber grows just like the regular Ylang-Ylang Tree but at 5' or 6' tall will start to vine. It is not an aggressive vine and won't take over. Artabotrys are very interesting, medium size vines from Asia. They are quite sturdy and easy to grow. Any location from full sun to bright filtered light would be good. Good drainage is important and the soil has to be moderately moist. Artabotrys are vines that can climb on a trellis, fence, or on top of other shrubs by special structures on the stems that resemble hooks. If left by themselves, the vine will grow on top of itself forming a mound. Most people that expect large, colorful flowers will be disappointed with the Artabotrys. The flowers appear during the warmer months on mature vines and are greenish/yellow and very often hidden by the leaves. These vines with shiny green leaves are not really grown for the flowers. People like them for the unusual fragrance of the flowers. One nickname for this vine is "Juicy fruit vine" because it smells like that type of gum. Artabotrys are tropical vines and have to be protected against freezing temperatures. They can also be grown in containers with proper trimming and brought indoors during the cold spells.